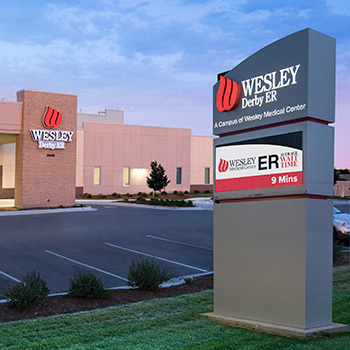 Wesley Derby ER, a campus of Wesley Medical Center, provides expert emergency and imaging services for South Wichita in a convenient location at 63rd Street South and Rock Road. A 11-bed, freestanding emergency department is open 24 hours a day, every day of the year. It is staffed with experienced emergency physicians, nurses and other healthcare professionals, and it is equipped with state-of-the art technology to help quickly and accurately diagnose and treat your emergency medical needs. Wesley Derby ER is part of the Wesley EmergencyCare Network, providing fast, close emergency care throughout Wichita and surrounding communities. Wesley Derby ER is prepared to treat patients with any type of illness or injury, with the exceptions of major traumas, heart attacks, strokes and imminent childbirths. Patients arriving with these conditions will be quickly stabilized and transported to the most appropriate hospital. Wesley Derby ER accepts most insurance plans, including Medicare.